Apple's new MacBook Pro models come with faster processors, more maximum RAM, and higher capacity SSDs all aimed at Apple's professional users, but none of those upgrades come cheap. 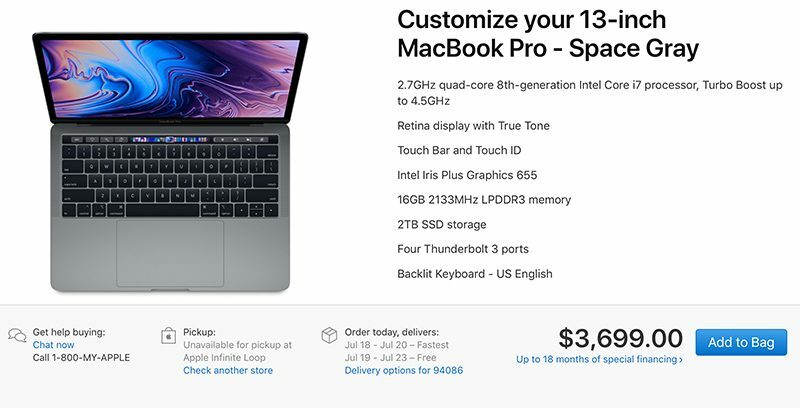 Base prices for the 13 and 15-inch MacBook Pro models are unchanged from last year, with pricing on new 13-inch models starting at $1,799 and pricing on new 15-inch models starting at $2,399, but build-to-order customizations can tack on thousands of dollars. That includes an additional $300 to upgrade to a 2.9GHz 6-core Core i9 processor, $400 to upgrade to 32GB RAM, and $3,200 to upgrade to the 4TB SSD. Comparatively, a maxed out 2017 15-inch MacBook Pro was priced at $4,199 for a 3.1GHz Core i7 processor and a 2TB SSD. It's the new 4TB SSD upgrade that's the most expensive, with Apple also offering more affordable 1TB and 2TB upgrades, for $400 and $1,200, respectively. Last year's 2017 MacBook Pro models maxed out at 2TB of storage rather than 4TB, and didn't offer RAM upgrades. 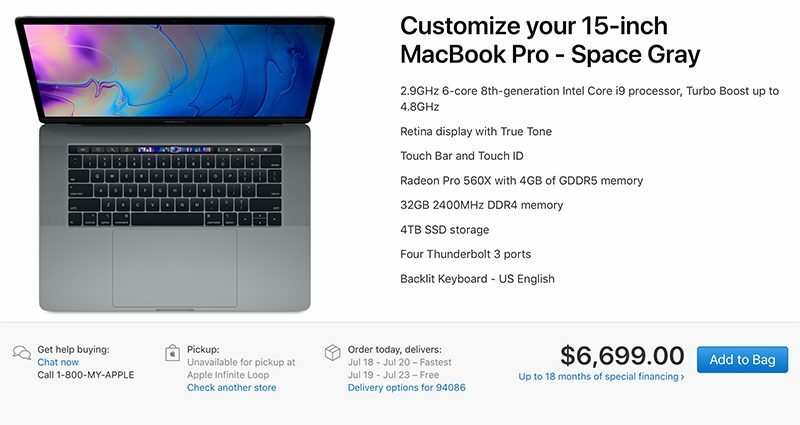 The highest-end stock 13-inch 2018 MacBook Pro with 2.3GHz quad-core Core i5 processor, Intel Iris Plus Graphics 655, 8GB RAM, and a 512GB SSD is priced at $1,999, but a fully maxed out machine will cost $3,699. That's an additional $200 for a 2.7GHz quad-core Core i7 processor, $200 for 16GB RAM, and a 2TB SSD for $1,200. 16GB RAM and a 2TB SSD are the maximum options for the 13-inch machine, with a 1TB SSD also available for $400. In 2017, a fully upgraded 13-inch MacBook Pro was priced at $2,899 for a 3.5GHz Core i7 processor, 16GB RAM, and a 1TB SSD. If you skip out on the SSD upgrades in the new machines, you can get a 15-inch MacBook Pro with maximum RAM and the best processor for $3,499, or a 13-inch model for $2,499, which is just a few hundred dollars more expensive than similar upgrades cost last year rather than a few thousand. Most users won't need 4TB of storage, but it's a good option to have for those professional users who do need the extra capacity. Apple's new MacBook Pros with customizations will be delivered starting on July 18 with the fastest shipping according to Apple's website, while stock configurations will be delivered starting on July 16. The new machines will be available in Apple retail stores later this week. You forgot to add the price for the dongles!!!! For $6699 you can't download from an SD card, plug in a ethernet cable, connect to HDMI, connect any legacy hard drives, etc etc. Man, the stuff I could do with that rig! Apple consumers don't know any better, they'll easily pay that much. How much did you pay for your 4TB nVME SSD, 32GB DDR4, i9 4.8GHz 6 core laptop with 4 thunderbolt ports? Is there even a laptop that powerful on Windows? Seriously... what is Apple smoking? A $7K laptop?!? Plus an additional $379 for AppleCare to get a 3 year warranty, which should come as standard IMHO. I thought (by reading all these forums) that everyone here wanted updated Macs. You're not aware of how options work?